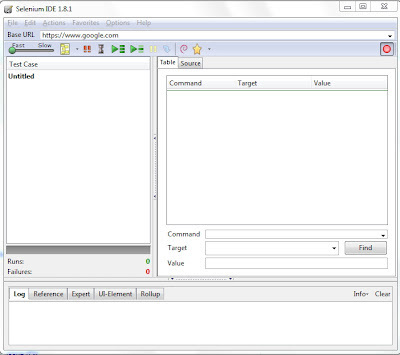 For installing selenium IDE open Mozilla firefox browser and go to SELENIUM website and click on version “Number” under the heading Selenium IDE and click on “Allow” button. Do not reload the page unless your installation step completes. After installing the IDE; Mozilla shows an option to restart the browser. Click on “Restart Now” button. Now after restarting; click on ‘Alt’ button of keyboard and click on tools option of Mozilla browser as shown above and select Selenium IDE. Selenium IDE pops up in record mode. Now place the website URL of which you want to record and playback. Start recording by clicking on links, buttons, tabs and drop downs of the website. Make sure that your website is opened in the Mozilla browser. Watch out for the code generated in selenium IDE. Do some trials and errors and check types of codes generated in IDE and see what happens when you play the recorded script. To know more about selenium scripts and commands and for tutorials visit Selenium Documentation page. Hope you enjoy recording, and scripting. Just sit back and watch how selenium runs the recorded scripts. Happy testing..!